Hello Internet! 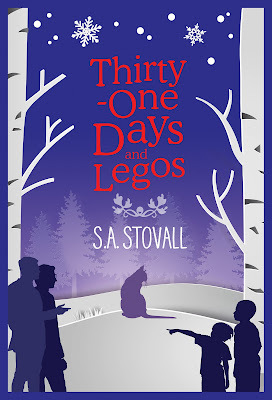 It’s me, SA Stovall, here to talk about my upcoming Christmas novella, Thirty-One Days and Legos, as well as share a quick excerpt! Thirty-One Days and Legos follows two men, Owen and Carter, who adopt a pair of brothers right before the Christmas season. While Owen wants to celebrate all thirty-one days as though they’re each their own Christmas, Carter struggles to connect with the two kids. Add in a new adopted cat and hijinks ensue! Check out the excerpt (Carter trying to relate to Edmund, the youngest of the boys) and see what I mean! After a minute in, I struggle to think of something to talk about. What do kids like? Destroying things? No, that’s incidental. Edmund turns around to face me, his eyes staring straight into mine as though he can’t wait to hear what I have to say. What’re we going to talk about? He’s six. It’s not like we can have deep philosophical discussions. What if I damage his frail little mind? Maybe I should just remain silent. No, the classes said not to do that. “Legos and superheroes,” Edmund says matter-of-factly. I regret my comment the second it leaves my mouth. He’s six. I shouldn’t be so quick to judge his fantastical choices. I guess that’s a little more useful than I originally thought. I recite the warning straight from the park handout. I’ve repeated the damn thing over a thousand times to visiting school classes, tour groups, and individuals who ask about feeding the muskrats. I whip around, half expecting Edmund to be mauled by a wolf. Instead, I find him crouched down, petting a small domesticated house cat. The gray feline purrs enough for the whole park to hear as she rubs against Edmund’s hands and legs. The erratic trail she left in the snow goes on for some time. She’s been traveling for a while. Sure enough, the cat has visible ribs and scrawny limbs. It’s a miracle she’s even alive. Most house cats don’t make it long in the snow, especially if they don’t have anything to eat. Tears well in the corners of his eyes. I grit my teeth and say nothing as he unzips his jacket and scoots the cat inside, allowing her head to poke up out of his collar. The feline doesn’t protest. If anything, she purrs louder, no doubt craving the warmth. “She needs a family,” Edmund continues, now hugging the cat like he’s hugging himself. How did this turn so upsetting so quickly?